Brazilian pianist Joana Holanda presents a program of new music for piano solo and with electronics by composers born in Brazil. Its music illustrates the diversity and richness of contemporary Brazilian music, encompassing a large variety of aesthetics and presenting composers of different generations. Electroacoustic composer/improviser from Berlin, Ignaz Schick performs his compositions for improvisers with members of sfSoundGroup and special guests. 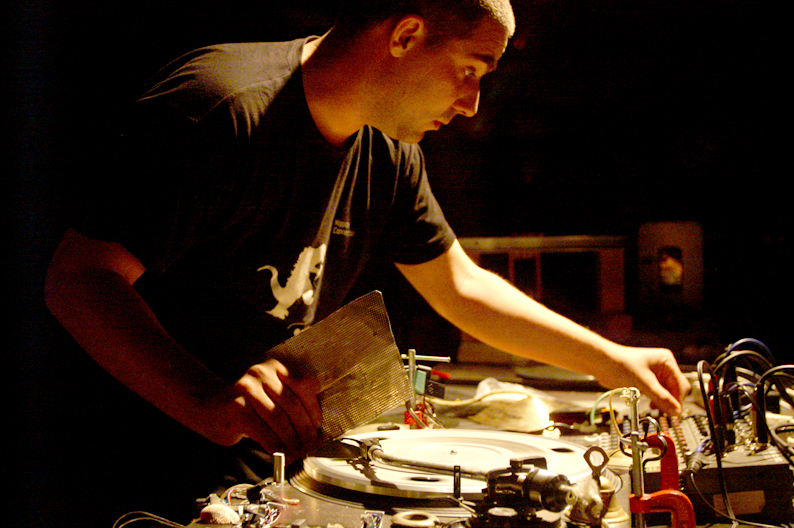 Turntablist, sound artist, performer & composer Ignaz Schick studied the saxophone and performed in free jazz and avant rock bands. At the same time he was getting obsessed with multitrack tape machines, record players and effect boxes and he started experimenting with many different instruments and sound making devices. After college he briefly studied at the Academy of Fine Arts in Munich and worked for several years as an assistent for contemporary composer Josef Anton Riedl. Since the late 1995 he works and lives in Berlin where he became an active and integral force of the so-called “Berlin Nouvelle Vague” and the blossoming “real time music” scene. From the middle of the nineties onwards his interest and activities almost completely shifted towards live-electronics and after testing various instrumentations (hard- & software samplers, signal processing, contact mics, field recordings, …) he developed his own and quite unique electro-acoustic set-up which he calls “rotating surfaces”. Various objects and materials (from wood, metal, plastic, paper or violin bows and cymbals) are played directly on the rotating metal plate of the turntable and the vibrations are simply amplified with a small condensator microphone. With this set-up he covers many different styles of contemporary experimental music – ranging from extreme reductionism via ambient, industrial, musique concrete, electronica to harsh noise. Besides his favorite setting, the direct duo-confrontation with the likes of Chris Abrahams (AUS), Alexei Borisov (RUS), Sebastian Buczek (PL), Phil Durrant (GB), Gunnar Geisse (D), GX Jupitter-Larsen/The Haters (USA), Dawid Szczesny (PL), Martin Tetreault (CAN) or Marcel Tuerkowsky (D) (…) he is member and founder of many different ensembles like Perlonex, Snake Figures Arkestra, Phosphor, Blind Snakes, Decollage, N.I.E., ….